Condition Assessment Programme (CAP) is a technical service to provide for applicants with no relation to the class of ship. It is an independent and thorough verification to rate the actual condition of the ship in accordance with a rating scale from 1 (very good) to 4 (poor), based upon detailed inspection, thickness measurements and strength calculation and performance testing. The CAP is applicable to oil tankers and bulk carriers of 15 years of age and above, and may well be used for ships at other ages and for other types of ships. The charterers are interested in the ships with CAP rating 1 or 2. • decisions on repair or investments in order to extend the lifetime of the ship. • buying and selling of the ship. • early identification of deficiencies. • extension of the lifetime of the ship. • maximized residual asset values. In general, the CAP consists of two modules, one is CAP for hull structures (HCAP) and the other is CAP for machinery (MCAP). The applicant may select the whole or one module or parts of it only, if applicable. In general, HCAP is to include check of documents and records, overall, internal and close-up surveys, thickness measurements and analysis, as well as strength assessment including longitudinal strength calculations, re-assessment of scantlings and fatigue strength assessment. Re-assessment of scantlings and fatigue strength assessment are optional. 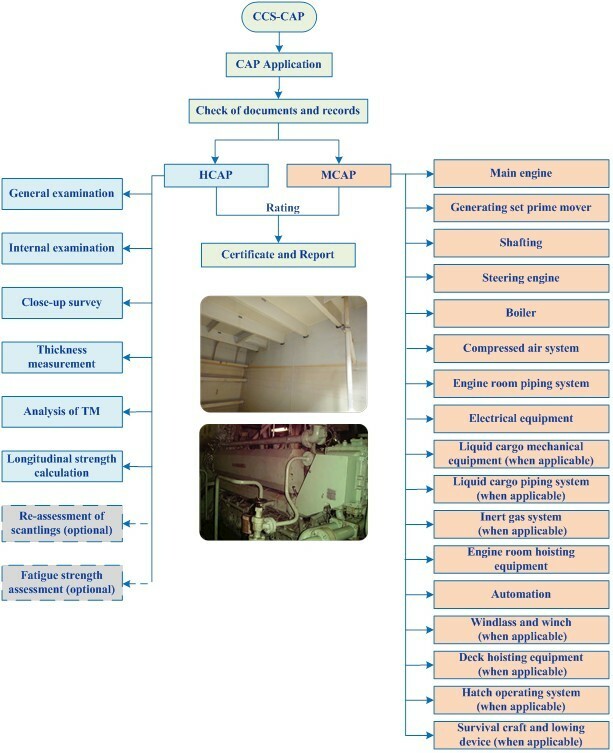 In general, MCAP includes check of documents and records, overall survey of machinery, function test, oil sample analysis and vibration measurement.